« IS A TANKLESS WATER HEATER WORTH THE INVESTMENT? For most plumbing jobs, a state contractor license is legally required. This may, of course, depend on the scope of the work, but in general, only licensed plumbers are permitted to advertise work within the trade. Licensing implies that those plumbers have had ongoing training, examination, and thorough experience to handle anything that comes their way. Licensed plumbers must also be insured to work in homes in your community. Generally speaking, licensing requires, at minimum, general liability insurance for contractors working on plumbing. What does this mean for you, though, as the end consumer? It means that you are protected if that plumber gets injured on the job or on your property while completing the job. You are well within your rights, when hiring a professional plumber, to ask them for proof of insurance before they begin their work. The fact is, professional plumbers go through years of training to be able to do what they do effectively and efficiently, avoiding problems now and in the future. 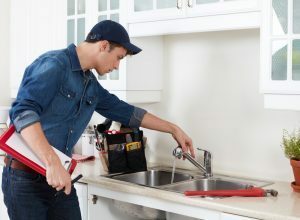 Under the watchful eye of more experienced, master plumbers, they’ve learned how to diagnose and repair any plumbing problems, including those unique to your area (whether this means your area is prone to hard water, water contaminants, or even flooding). What Can Go Wrong with Amateur Work? Choosing the wrong tool to remove a clog or fix a leak, thereby causing even more damage to your plumbing. Lacking the correct inspection equipment, making them ineffective at actually fixing the problem thoroughly. Doing a shoddy job on a plumbing fixture or appliance installation. Failing to follow local building codes, leading to problems later on if or when you decide to sell your home. Doing a poor repair job that requires you to pay for professional work anyway just so they can fix the mistakes.